The final table of the 2012 World Series of poker Main Event Championship is now set, after the elimination of Gaelle Baumann in 10th place. Here is a look at the nine players who will be back at the Rio in October to compete for poker’s most prestigious title. Russell Thomas has four career cashes, and all have come at the World Series of Poker. The Pennsylvania native will be taking a solid stack into October’s final table, where he would like to improve upon his 5th place finish in the $1,500 6-Max NLHE event at the 2010 WSOP. Blasiger hails from Tempe, AZ and is one of the least experienced players at the final table. According to thehendonmob.com database, Balsiger has only two previous career cashes, the biggest coming earlier in the 2012 WSOP when he cashed for just over $3,000 in Event #2, a $1,500 NLHE tournament. 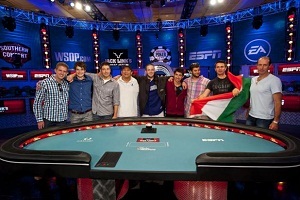 Ausmus’ 2012 WSOP has been the stuff of legend, considering the poker pro’s Main Event run is his ninth cash of the tournament series. Despite his short-stack the Nevada resident could be a major force at the final table should he get his hands on some chips. Gee is a 2010 WSOP bracelet winner, in the $1k NLHE event, but is usually found playing smaller buy-in events in and around Los Angeles where he has racked-up numerous cashes over the past five or so years. Merson won his first WSOP bracelet earlier this year by winning the $10k 6-Max NLHE event. Merson also final-tabled another tournament at the 2012 WSOP, the $2,500 4-Handed NLHE event, and is one of the most experienced players left in the Main Event. will be one of the favorites to win the tournament. won a $1,000 buy-in NLHE side event at the NAPT at the Mohegan Sun casino. over $1.7 million in the process.